Ing "Beethoven" lilipat ya keni. Para keng aliwang gamit, lawen ye ing Beethoven (disambiguation). I Ludwig van Beethoven (English pronunciation: /ˈlʊdvɪɡ væn ˈbeɪtoʊvɨn/ (US), /ˈlʊdvɪɡ væn ˈbeɪthoʊvɨn/ (UK); German: [ˈluːt.vɪç fan ˈbeːt.hoːfən] ( makiramdam); mebiniag 17 Disiembri 1770 – 26 Marsu 1827) metung yang German talakudta ampong pianista. Metung yang maulagang tau keng panaun ning pamaglipat pialtan ding Classical ampong Romantic panaun inyang Western classical music, ampong mabibilang ya angga ngeni bilang bantug ampng mapanasag a talakudta king eganaganang panaun. ↑ Beethoven was baptised on 17 December. 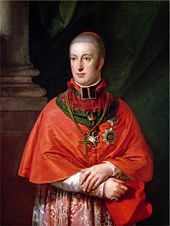 His date of birth was often, in the past, given as 16 December, however this is not known with certainty; his family celebrated his birthday on that date, but there is no documentary evidence that his birth was actually on 16 December. Clive, Peter (2001). Beethoven and His World: A Biographical Dictionary. Oxford University Press. ISBN 0-19-816672-9. Solomon, Maynard (2001). Beethoven, 2nd revised, Schirmer Books. ISBN 0-8256-7268-6. Stanley, Glenn (ed) (2000). The Cambridge Companion to Beethoven. Cambridge University Press. ISBN 0-521-58074-9. Albrecht, Theodore, and Elaine Schwensen, "More Than Just Peanuts: Evidence for December 16 as Beethoven's birthday." The Beethoven Newsletter 3 (1988): 49, 60–63. DeNora, Tia. 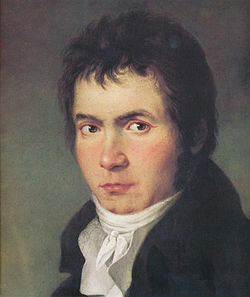 "Beethoven and the Construction of Genius: Musical Politics in Vienna, 1792–1803." Berkeley, California: University of California Press, 1995. ISBN 0-520-21158-8. Hatten, Robert S (1994). Musical Meaning in Beethoven. Bloomington, IN: Indiana University Press. ISBN 0-253-32742-3. Atiu king Wikisource ing articulu ning 1911 Encyclopædia Britannica Beethoven, Ludwig van. Beethoven Depot. Contains all of his works in midi format. Beethoven's Letters 1790–1826, Volume 1, Volume 2. In English at Gutenberg.org. Beethoven: The Immortal. Introduction and detailed account of the composer's life. Articles include his deafness, demeanor, daily routine, medical history, final days, and letters. Webcam pic from the Beethoven-Haus showing the rear of the building as photographed within the last minute. 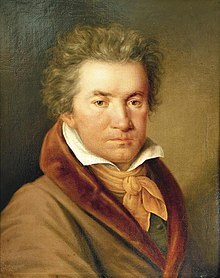 One Stop Beethoven Resource — articles and facts about Beethoven from Aaron Green, guide to Classical Music at About.com. University of Quebec In French. Contains links to the works arranged according to various criteria, and to a concordance of the various catalogues. Beethoven on the Internet Archive. Free, public domain/out of copyright, mp3 files, including the Violin Concerto with Jascha Heifetz. The Unheard Beethoven — MIDI files of hundreds of Beethoven compositions never recorded and many that have never been published. Beethoven cylinder recordings, from the Cylinder Preservation and Digitization Project at the University of California, Santa Barbara Library. Template:Musicbrainz artist, a collection of information about commercial recordings. The British Library Archival Sound Recordings online audio service includes 100 years of String Quartets.